Family-friendly places like Colosseum and Palatine Hill will thrill your kids. There's much more to do: admire the local landmark of Trevi Fountain, steep yourself in history at St. Peter's Basilica, don't miss a visit to Roman Forum, and admire the masterpieces at Galleria Borghese. Mumbai, India to Rome is an approximately 14.5-hour flight. You can also do a combination of flight and train; or do a combination of bus, taxi, and flight. You'll gain 4 hours traveling from Mumbai to Rome due to the time zone difference. Expect little chillier weather when traveling from Mumbai in May: highs in Rome hover around 28°C, while lows dip to 17°C. Finish your sightseeing early on the 19th (Sun) so you can take a train to Florence. Kick off your visit on the 20th (Mon): enjoy breathtaking views from Campanile di Giotto, get to know the fascinating history of Piazza della Signoria, admire the masterpieces at Pitti Palace, then get great views at Piazzale Michelangelo, and finally admire the natural beauty at The Boboli Gardens. Get ready for a full day of sightseeing on the next day: appreciate the extensive heritage of Piazza del Duomo, take in the architecture and atmosphere at Cathedral of Santa Maria del Fiore, explore the world behind art at Uffizi Galleries, then snap pictures at Ponte Vecchio, then examine the collection at Academy Of Florence Art Gallery, and finally make a trip to Ratto della Sabina. For ratings, maps, and tourist information, read our Florence trip planning site . You can take a train from Rome to Florence in 2 hours. Other options are to drive; or fly. Traveling from Rome in May, Florence is slightly colder at night with lows of 13°C. Finish your sightseeing early on the 22nd (Wed) to allow enough time to take a train to Milan. Kick off your visit on the 22nd (Wed): get to know the fascinating history of Piazza del Duomo, step into the grandiose world of Castello Sforzesco, then take in the spiritual surroundings of Duomo di Milano, and finally admire the striking features of Galleria Vittorio Emanuele II. To find more things to do, ratings, other places to visit, and more tourist information, read Milan travel itinerary planner. You can take a train from Cinque Terre to Milan in 3 hours. Another option is to drive. May in Milan sees daily highs of 26°C and lows of 15°C at night. Finish your sightseeing early on the 23rd (Thu) to allow enough time to travel to Athens. Kids will enjoy Attica Zoological Park and Glyfada Beach. The adventure continues: take a stroll through Monastiraki, delve into the distant past at Temple of Athena Nike, contemplate in the serene atmosphere at Temple of Hephaestus, and admire the masterpieces at Museum of Cycladic Art. For ratings, other places to visit, where to stay, and tourist information, use the Athens trip planner . You can fly from Milan to Athens in 6 hours. Alternatively, you can do a combination of train and flight; or drive. The time zone difference when traveling from Milan to Athens is 1 hour. Traveling from Milan in May, Athens is somewhat warmer at night with lows of 20°C. You will have some time to spend on the 26th (Sun) before leaving for Delphi. Kick off your visit on the 26th (Sun): contemplate in the serene atmosphere at Hosios Loukas and then delve into the distant past at Temple of Apollo. Get ready for a full day of sightseeing on the 27th (Mon): take in the architecture and atmosphere at Church of the Holy Trinity, get engrossed in the history at Delphi Archaeological Museum, then contemplate in the serene atmosphere at Tholos, and finally explore the ancient world of Delphi. For traveler tips, photos, more things to do, and tourist information, you can read our Delphi road trip website . You can drive from Athens to Delphi in 2.5 hours. Alternatively, you can do a combination of train and taxi; or take a bus. Expect slightly colder evenings in Delphi when traveling from Athens in May, with lows around 15°C. Wrap up your sightseeing on the 28th (Tue) to allow time to drive to Athens. 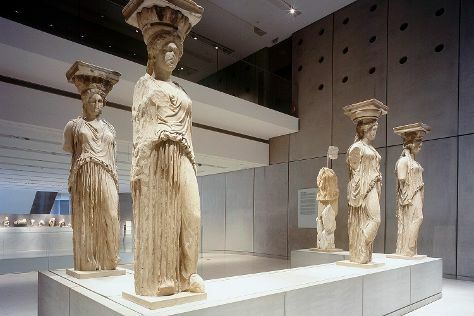 Start off your visit on the 28th (Tue): appreciate the history behind Temple of Olympian Zeus, then get engrossed in the history at Acropolis Museum, and then explore the ancient world of Acropolis of Athens. On your second day here, admire the masterpieces at National Archaeological Museum, then don't miss a visit to Syntagma Station, then explore the engaging exhibits at Museum of Greek Children's Art, and finally take a stroll through Plaka. For ratings, photos, traveler tips, and tourist information, read our Athens trip maker website . Traveling by car from Delphi to Athens takes 2.5 hours. Alternatively, you can do a combination of taxi and train; or take a bus. Traveling from Delphi in May, Athens is a bit warmer at night with lows of 20°C. You'll have a few hours on the 30th (Thu) to wrap things up before traveling home.